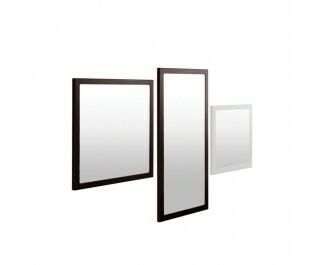 Wall mirror in 4 sizes. Laser cut natural sheet steel frame, 45 mm large. Black phosphatized finish, final fixing with bees’ wax. See BIG IRONY characteristics on page 51. Alternative version epoxy painted semiopaque white. Available on request copper black painted, +15% price increase. 4 mm mirror on wooden support. Vertical or horizontal fitting.